I finally made it to Walgreens Saturday and bought the L’Oreal FAR to keep my gift card balance rolling. This scenario was listed in our weekly Walgreen’s post and since I was wanting some cereal I went with it. 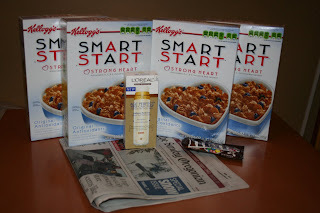 So I came out with the L’Oreal FAR moisturizer, 4 boxes of Smart Start cereal, and three bags of M&M’s as a filler. Bought Sunday paper with the RR’s making it free. Will receive $16.49 back on my Walgreen’s gift card.